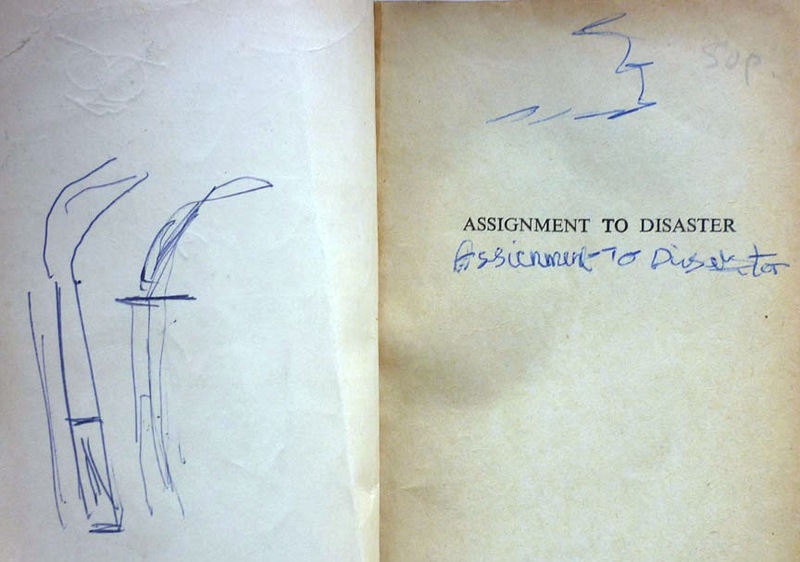 NB: Featured as one of this week's Friday's Forgotten Books. 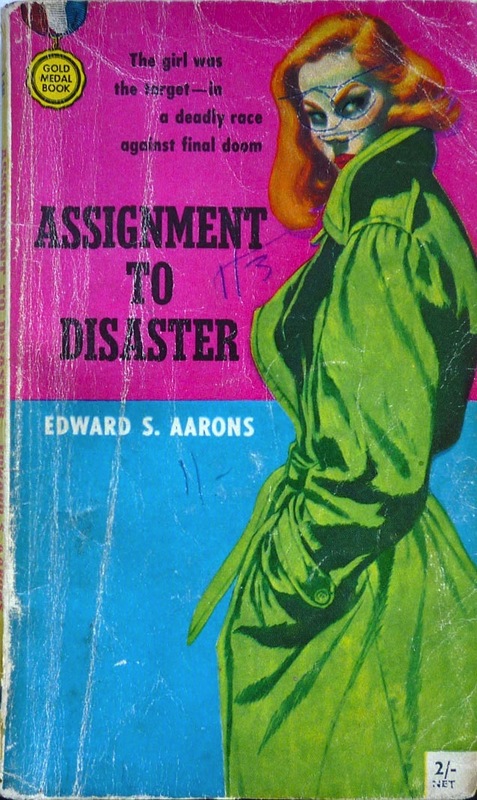 Published straight to paperback by Gold Medal in the States in 1955 and Frederick Muller in the UK shortly thereafter, Assignment to Disaster is, as others have remarked, atypical in comparison to the Assignment series as a whole, as it's set firmly within the USA (the vast majority of the forty-eight Assignment novels are set in exotic overseas locales). 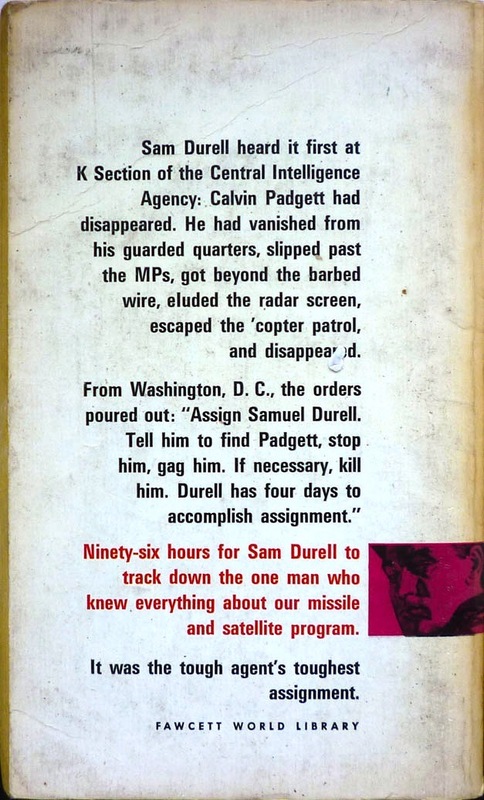 The story sees Sam Durell, agent of super secret CIA department K Section, tasked with locating missing scientist Calvin Padgett, who, before he disappeared, was working on a project to launch a nuclear missile into orbit. Durell's only lead is Padgett's sister, Deirdre (a name which, for me, never fails to bring to mind this Deirdre), but she's being hunted by the same nefarious agents who apparently kidnapped her brother. And so Sam is forced to go on the run with her, pitting him against not only his own colleagues in the CIA, but the FBI as well. Essentially, Assignment to Disaster is one long pulse-pounding perspiration-drenched pursuit across the States, punctuated by bursts of violence – Sam is really put through the wringer – and a curious stopover at Sam's grandpa's beached bayou paddle steamer. As Doug Bassett notes, though markedly different to what would come after, the book sets up the basics of Sam's world, from his job description to his Cajun heritage and "improbable grandfather"; it's a decent little spy thriller, and a key work in that it helped ignite America's postwar passion for Cold War espionage fiction. Weirdly, I'm sort of loath to part with this copy; I can't help wondering who it was who elected to use Gold Medal's sales blurb as a basis for learning to write. That's if that was the intention; I guess it could have been a trainee copywriter soaking in the deathless prose of a sales and marketing master. I am not so interested in these faux-Bond titles. 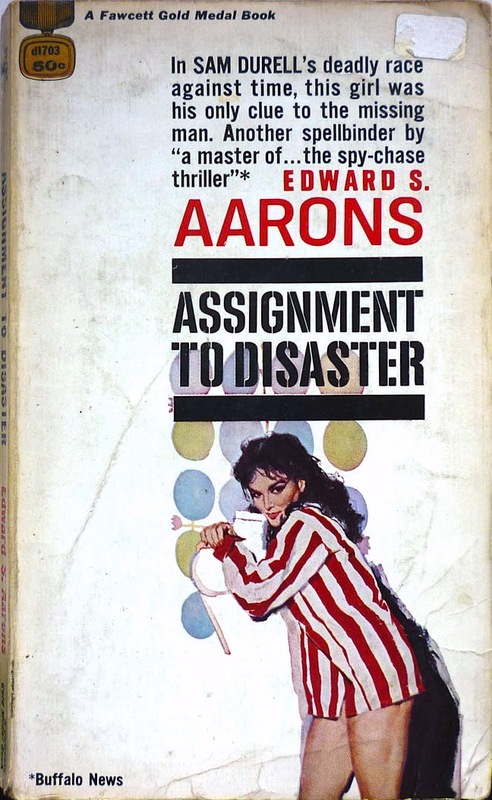 It seems as revolutionary as the Bond novels and films were they produced an amazing amount of bad rip-offs. 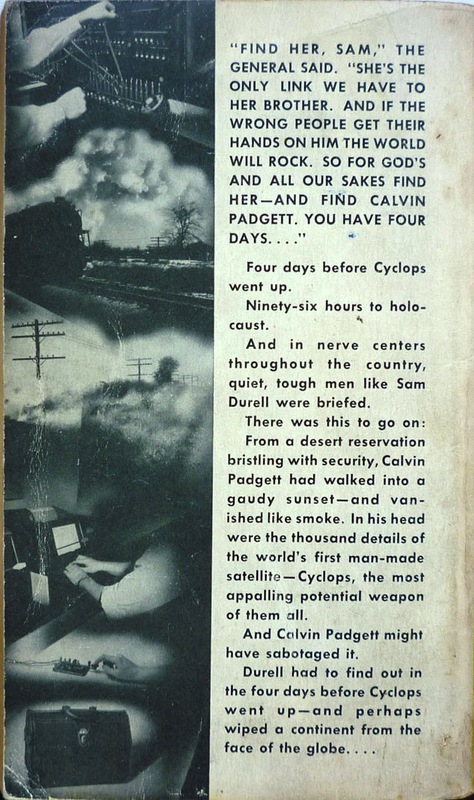 I am still waiting for the inimitable Nick Jones review of a Travis McGee novel. That's great except this is not a faux-Bond and is actually quite superior to any of Fleming's novels. I really can't agree with that assessment, Dave. Certainly the Bond novels helped to spur a wave (though they were far from alone), but these books stand on their own. Just because something doesn't come first, doesn't make it invalid. 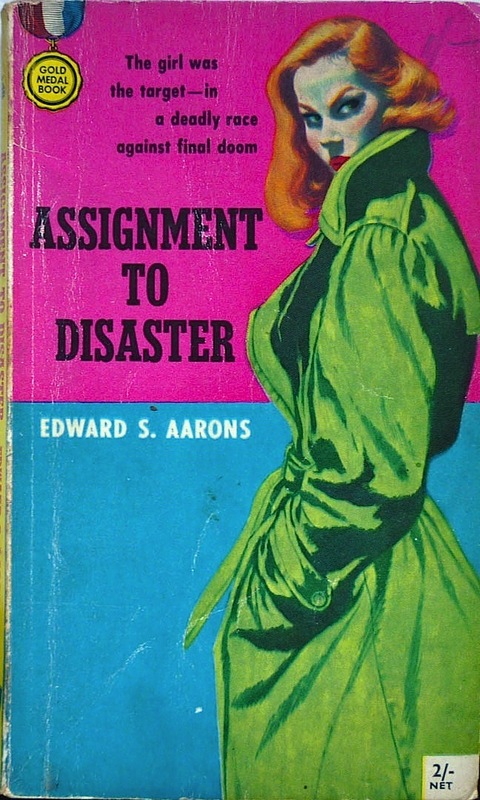 Plus, Aarons was a very different stylist than Fleming. You should read one. Funnily enough, Olman, I was making pretty much the same point in the comments on the previous post. Who's to say if Aarons had even read Fleming before penning Assignment to Disaster; Casino Royale wasn't published in the US until 1954, and didn't sell that well anyway. Dave, I promise you won't have much longer to wait for some thoughts on McGee! In all fairness to the OP on this thread, he's always been very consistent in his policy that one has every right to pass judgment on any book or film, sight unseen. Fascinating--so glad you started this, Nick. Research is a bit spotty (Casino Royale came before Assignment Disaster), but gives you an idea of how the series developed. There really is SO much less written about Aarons than Fleming--out of all proportion to the disparity in book sales, and Durell obviously sold a whole lot of books. Casino Royale came out shortly before the first Durell, but basically vanished without a ripple in the American market. The next Bond, Live and Let Die, didn't do much better stateside, but got a lot of very favorable notices from prominent critics. Fleming was originally considered to be a worthy successor to Raymond Chandler (Chandler himself liked the early 007 novels). 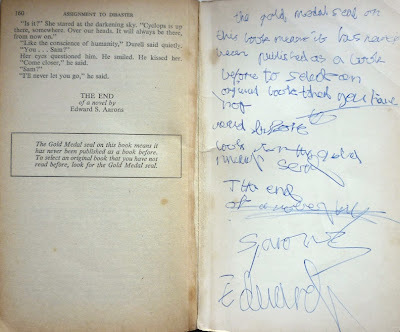 That's after the first Durell came out, but hard to think Gold Medal wasn't paying attention as the Bond buzz grew louder--Durell got tweaked quite a lot in later novels, probably not just in reaction to Bond, but in part. He was not originally a superspy--just a capable one. In terms of book sales, Bond didn't become a force to reckon with in the U.S. until 1961, when President Kennedy said From Russia With Love was one of his ten favorite books. That created a run on 007, which led to Dr. No being made into a movie (not the first adaptation, but the first that clicked), and once the Connery films started coming out, everybody else in the spy-biz was an also-ran. Curious, though--with the plethora of spy films in the 1960's, featuring Bond, Helm, Flint, Palmer, Quiller, etc--why were there no Durell films? If they'd started in the late 50's/early 60's they could have gotten Robert Mitchum to play him (Cape Fear was 1962, and Mitchum was at the absolute top of his game then--not even Connery was quite in that league). If that had happened, the whole story could have gone very differently (though I don't see Mitchum doing more than one or two). When exactly did the Durell books start selling big? Though there were quite a few of them by 1961, that doesn't mean the series had really taken hold, since Gold Medal wasn't really about mainstream best-sellers most of the time--Durell was probably doing tidy book sales from the first, but I'd guess it was the Bond-inspired spy craze of the 60's that sent his sales skyrocketing, and made it possible for Aarons to finally make his mark, after a long career of writing little-noticed mysteries. 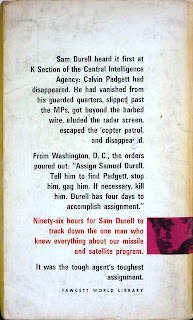 So yes, I think James Bond was an influence on Sam Durell, but only well after both had made their respective debuts. Chris, point taken. After all my yak-yak about not judging a book by it's cover, I shouldn't neccessarily clump this writer in with the faux Bonds.